The Smart Investor has collected card information independently. Issuers did not provide the details, nor are they responsible for their accuracy. The review is not a recommendation, the actual rates/fees may be different. The appeal of the Simmons Bank Visa Platinum Card lies entirely in its industry leading financing terms where consumers pay a 10.24% Variable APR on credit card balances. This is a very rare interest rate since most credit cards charge 16-26% on average which can put you further behind and make paying off your debt feel like a never-ending hamster wheel. With a 10.24% rate, your balance will grow at a slower pace, giving you more time to get it paid down and become a credit card deadbet! In terms of rewards and sign up bonuses, the Simmons Visa does not offer an enticing rewards program. You’ve seen the highlights above, however, that come with this card. In our view, the Simmons Visa credit card is meant for consumers who need great financing terms and this card is not recommended for consumers who want the best rewards program. The Simmons Bank Visa Platinum Card has a 10.50% APR which is the lowest APR available to the public for any credit card. This makes it a great credit card for individuals who carry a monthly balance since they’ll be paying a lower interest rate monthly compared to other credit cards. Considering the average transfer fee is 3%, this benefit of paying a zero-transfer fee can actually save you a substantial amount of money depending on how big of a credit card balance you’ll be transferring over. For example, if you have a $10,000 balance then you’ll be saving $300 in transfer fees. The no annual fee will save you some money each year but it’s not that uncommon of a benefit for credit cards that focus on financing. However, you still at least save $15 to $200 that you may have to pay as an annual fee if you went with another credit card. If you’re looking for a credit card that offers rewards, then this credit card may disappoint due to its lack of rewards offered. This is common, however, among credit cards that are financing focused. These types of credit cards make up for their lack of rewards by helping customers in other ways like saving them money on $0 transfer fees and lower interest rates towards the monthly debt balance. Since this card does not offer a 0% intro rate, you’ll immediately begin paying interest on the balance you transfer over. This is a possible drawback for individuals who carry a credit card balance month to month and plan to pay it off in the short term. There are other credit card options out there that offer 0% interest for the first 15 to 21 months which may be a better option if you plan to pay off your debt in the short term. 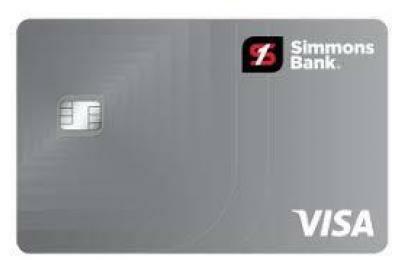 The Simmons Bank Visa Platinum card will not be available to most people due to its excellent-credit approval requirement. This is ironic because most debt burdened customers who need access the most to the finance charge savings won’t be apple to qualify for this credit card. Prior to applying, check your credit score for free to ensure you have a high score that will give you a chance at qualifying. Several other credit cards provide similar financing benefits to Simmons Bank Platinum Visa card while also offering the enticing sign-up bonuses and intro APR periods that the Simmons Visa lacks. The Barclaycard Ring Mastercard offers a competitive 14.24% APR compared to Simmon’s 10.5% APR but Barclay also offers a 0% intro APR for 15 months on balance transfers made within 45 days of opening an account. This gives you 15 months to pay off your previous balance without paying interest on it, which is a great benefit if you had planned on paying off your debt in the short term but not right away. Barclays Mastercard does not offer a 0% intro APR on purchases however, which is equal to the Simmons Visa. So, any new debt you acquire and don’t pay off each month, you’ll pay the 14.24% interest rate. There is also no annual fee with the Barclay Mastercard, which is another benefit if you’re someone who hates credit cards that have annual fees. The City Simplicity card is a no annual fee credit card but like the Simmon’s Visa, it does not offer a rewards program and does not offer sign up bonuses. As a Citi Simplicity card holder, you get access to purchase protection and identity theft support. You also get a 0% intro APR for 12 months on purchases and 0% intro APR on balance transfers for 21 months. Paying 0% on purchases for 12 months is a huge benefit if you aren’t going to be paying off the balance month to month due to your financial circumstances and you need credit card financing. Once these intro periods end, you’ll pay between 16.24 and 26.24% Variable APR. If you’re not interested in chasing rewards and sign up bonuses, then this credit card could be for you. Is the Simmons Bank Visa® Platinum Card Right for You? The lack of rewards program makes this credit card boring for the average consumer who does every day spending with their credit card and pays off their monthly balance in full. But for the average consumer who carries a monthly credit card balance and doesn’t see themselves being able to get out of debt for many years, then this is a great option for saving you money thanks to the industry best, 10.5% APR. You’ll also benefit from the zero transfer fees policy. However, if you plan to pay off your balance in the short term, you should explore other credit card options that offer a 0% intro rate on purchases and on balance transfers since the Simmons Bank Visa Platinum card does not. ›Credit Card Cashback, Rewards or Miles? ›How Can You Get a Card with Bad Credit? ›How Does Credit Card Interest Work? ›How To Negotiate A Balance Transfer Fee?